Each year crop yields are severely impacted by a variety of stress conditions, including heat, cold, drought, hypoxia, and salt. Reproductive development in flowering plants is highly sensitive to hot or cold temperatures, with even a single hot day or cold night sometimes being fatal to reproductive success. In many plants, pollen tube development and fertilization is the “weakest link”. The focus of this project is on developing two strategies to improve stress tolerance in pollen. The first is to express “stress protection” genes to enable pollen to better cope with a stressful environment. A priority will be given to testing stress response genes from a resurrection plant, which displays a remarkable ability to desiccate during hot and dry conditions, and then rehydrate within hours of re-watering. The second is to “rewire” a signaling pathway in pollen to more strongly activate the pollen’s internal stress responses. The signaling pathway involves a cyclic nucleotide gated channel (CNGC16), which was discovered in the UNR’s Dr. Harper lab, to regulate that activation of heat and drought stress response pathways in pollen. This project was designed to provide novel and fundamental insights into mechanisms of stress tolerance, and provide potential tools of widespread use in engineering plants for increased reproductive success under conditions of temperature stress and drought. If successful, the tools developed here will have application to improving seed yields in many crops, including Camelina, which has been proposed as an oil seed biofuels crop for Nevada. Therefore, the research goals will also enable Nevada to become more energy independent by improving the production yields for a renewable biofuel crop. The most serious threat from climate change is the potential disruption in our ability increase food production at a pace needed to feed the expanding world population. It is likely that more extreme weather patterns will have devastating effects on our ability to grow conventional crop plants in key regions around the world. In many seed producing crops, pollination is the most heat-stress sensitive part of the life cycle, and the most difficult to mitigate. Unlike drought stress, which can potentially be solved by engineering irrigation systems, there is no reasonable solution to save a crop from a “heat wave”. Thus, we believe that developing strategies to increase pollen fertility under stress conditions is a critical issue facing agriculture over the next 50 years. Arabidopsis as a Model. We have chosen Arabidopsis thaliana as a model system because of the genetic resources available to rapidly identify and functionally evaluate genes involved in a pollen stress response. The pollen from the Columbia ecotype display a moderate level of heat stress tolerance, with test tube germination and tip growth severely disturbed at temperatures above 82°. This baseline level of heat tolerance provides an excellent starting point for identifying transgenes that either increase or decrease stress tolerance in transgenic plant pollen. While many expression-profiling studies have investigated stress-dependent changes in the RNA (a ubiquitous family of large biological molecules that perform multiple vital roles in the coding, decoding, regulation, and expression of genes) of vegetative tissues from many plant species, relatively little is currently known about changes in pollen. The profiling included in this research provides the first investigation into stress-dependent changes in the Arabidopsis pollen RNA. A unique feature of pollen that distinguishes it from other tissues is the necessity to maintain an extremely rapid growth program while still dealing with stress. Therefore an in-depth expression profiling analysis for pollen is essential for understanding the pollen heat stress response. As candidate stress tolerance genes emerge from this and other studies, they will be considered for their potential use in crop plants. 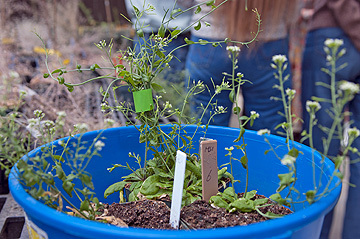 The Harper lab will focus on applications with Camelina, an edible oil seed crop that has commercial interest in Nevada where water resources are very limited, and the spring growing season is characterized by extreme swings from freezing nights to heat-stressed days. The Harper lab is actively engaged in multiple projects to make this already durable crop even more productive in marginal environments. Aim 1) Over-express “stress protection genes” in pollen. The approach is to use a pollen specific promoter to express > 20 transgenes, including those encoding heat shock proteins and dehydrins from a resurrection plant, as well as transcriptional regulators predicted to activate stress response pathways. The hypothesis to be tested is that pollen fertility can be increased under stress conditions through over-expression of a “stress protection gene”. Aim 2) Engineer CNGC16 with mutations in its regulatory domain. The approach is to mutate a calmodulin-interaction domain that is proposed to inhibit channel activity. The hypothesis to be tested is that a CNGC16 can be modified to more quickly or strongly activate an endogenous stress response pathway. Aim 3) Compare heat-stress dependent changes in gene expression between wild type pollen and transgenic pollen showing increased stress tolerance. The approach will include RNA-seq analyses of pollen grains harvested during a heat stress. The hypothesis to be tested is that increased stress tolerance is accompanied by increased expression of a network of “stress protection” genes.